When you pursue an online master's degree in gerontology, you will study aging and its effects on society. This degree prepares you for a variety of careers, such as social and community service manager, medical or health services manager, social worker, researcher, or adult care specialist. Due to the aging baby boomer generation, combined with the fact that people typically live longer now than in previous generations, the senior citizen population is on the rise. Consequently, the job market in gerontology is also performing quite well; the Bureau of Labor Statistics projects that by 2026, job opportunities for medical and health services managers will increase 20% and job opportunities for social and community service managers will grow 16%. All of the best online master's in gerontology programs cover similar subject matter, with coursework focusing on the social and psychological ramifications of aging rather than delving deeply into medical topics (which are typically covered in geriatrics programs). Foundational courses for gerontology include the physiology and psychology of aging, economic issues affecting senior adults, management of programs for seniors, and ethics. These subjects prepare students for future career paths in the field, particularly in management or other leadership positions. Some schools offer a concentration such as management of aging services or geriatric psychology as part of their online gerontology master's degree. Others offer a graduate certificate in gerontology. You may even have a choice between an online master's degree in gerontology and an MBA with a concentration in gerontology. Consider which type of program best suits your career aspirations. It's also important to closely examine the requirements of each program to make sure you can fulfill them. One program may include a master's thesis or capstone project, while another may have a research requirement, an internship, or a practicum. What will I Learn in an Online Gerontology Master's Program? Nova Southeastern University ranks #1 on The 10 Best Master's in Gerontology Degree Programs! Based in Fort Lauderdale, Florida's Nova Southeastern University primarily uses Blackboard to deliver online coursework asynchronously. The school offers a master's of arts degree in gerontology. The program's curriculum consists of 33 credits, typically requiring one year of full-time study to complete. Students complete 18 credits of six core courses -- including studies in the sociology, psychology, and biology of aging -- and choose one from these nine-credit concentrations: public health, gerontology and the family, emergency preparedness, or professional geriatric care management. The curriculum concludes with a capstone seminar and project. Other notable courses include aging and diversity, humanities and aging, and concepts and controversies in aging. NSU's online gerontology master's degree has no in-person requirements. All applicants must have a minimum GPA of 3.0 over their last 60 undergraduate credits. Students who do not meet this requirement must have a minimum total score of 950 on the quantitative and verbal GRE components. Each applicant must also complete a telephone interview with an NSU admissions counselor. NSU also strives for affordability in its online programs, as all students -- in-state residents or otherwise -- pay the same per-credit tuition rate. Upon graduating, NSU's gerontology students are prepared to work in healthcare and human and social services settings, including nursing homes, senior centers, hospitals, hospices, and retirement communities. Webster University ranks #2 on The 10 Best Master's in Gerontology Degree Programs! Students pursuing their master's in gerontology online at Webster University -- which operates a central campus located in St. Louis, Missouri -- have two distinct options: a 36-credit master of arts in gerontology and a 54-credit MBA degree with a concentration in gerontology. The MA in gerontology program usually takes students 12 months of full-time study to finish, while the MBA usually requires 18-24 months. Both programs share eight required core courses, making up 24 credits of each degree. Noteworthy courses include economic issues for older adults, research and assessment in gerontology, and integrated studies in gerontology -- a course weaving together humanities, life science, and social science approaches to the study of aging. In Webster's MA in gerontology program, students complete the rest of their coursework via electives. There is no capstone experience, and the program never requires online students to set foot on campus. With no concentrations, the program covers all angles in gerontology from economic, social science, psychological, and physical perspectives. Students can pursue their online master's in gerontology at Webster via full- or part-time study. Since Webster delivers coursework asynchronously, the school encourages working professionals to apply, as they can complete assignments at their convenience. Students must have a minimum undergraduate GPA of 2.5 to qualify for admission to Webster's MA in gerontology program; however, there are no GRE requirements. The school accepts students on a rolling basis. Additionally, students must earn at least a “B-” average over their first 12 credits in Webster's gerontology program to achieve candidacy status. Kansas State University ranks #3 on The 10 Best Master's in Gerontology Degree Programs! Based out of Manhattan -- the mid-sized city in Kansas, not the Big Apple -- Kansas State University leverages its considerable state school resources to offer online programs through its Global Campus. A result of those resources is the school's master of science degree in gerontology -- one of the best online programs of its kind in the nation. The program requires 36 credits, which usually take students about 12 months of full-time study to finish. KSU's Global Campus utilizes asynchronous learning, and since there are no in-person requirements, students earning their online master's degree in gerontology at KSU need never visit campus. KSU is accredited by the Higher Learning Commission of the North Central Association of Colleges and Schools. Since KSU has the resources of a large university, the school has the capacity to operate an entire Center on Aging, a unique element of the program. In addition, although KSU is a state university, all students in the Global Campus pay the same per-credit tuition rate, regardless if they're a resident of the state. For admission to KSU's MS in gerontology program, students must have a minimum GPA of 3.0 over their last 60 credits -- or two years -- of undergraduate study. Applicants do not need to submit GRE scores, and KSU accepts applicants on a rolling basis. University of Indianapolis ranks #4 on The 10 Best Master's in Gerontology Degree Programs! A medium-sized, private, Methodist-affiliated university, the University of Indianapolis offers an online master of science degree in gerontology. The 36-credit program -- which usually takes students a year of full-time study to complete -- is one of the few master's degree in gerontology online programs to have earned the Program of Merit designation from the Association for Gerontology in Higher Education. Of those 36 credits, 15 (or five courses) are core requirements, including a research methods course and studies in interdisciplinary perspectives on aging and the psychology and physical elements of aging. Students also choose a concentration -- aging in place or applied public policy -- and take courses related to their specialty. Students have the option of completing skills courses in specialized areas like grant writing and program evaluation. Finally, all students must complete both a practicum and a capstone experience. Online courses in the program are small (12-18 students) and make use of asynchronous learning. Many courses also include hands-on learning in each student's local community, and students often collaborate on projects. All applicants must have a minimum undergraduate GPA of 3.0. The GRE is not required for admission. Students can apply for admission in August, January, and May. University of Nebraska at Omaha ranks #5 on The 10 Best Master's in Gerontology Degree Programs! Based in the largest city in the Cornhusker State, the University of Nebraska at Omaha is a key cog in the state-school system. Also known as “UNO” or simply “Omaha,” one of the school's premier online offerings is its master of arts degree in social gerontology. This online gerontology master's degree focuses specifically on social gerontology, opting for a more humanities and sociological approach to the study of aging as opposed to a physical or biological approach. Online students in the program can opt for either a non-thesis or thesis track. The thesis option targets students already at mid-career points in the field and looking to conduct their own original research. The non-thesis option is designed for those not yet in the professional field or for early-career professionals. Each path consists of 36 credits. Full-time students can earn their degree in only 12 months, but many of Omaha's students are professionals pursuing a part-time course of study and thus take longer to finish. Omaha is accredited by the Higher Learning Commission. Omaha delivers coursework in the program asynchronously, giving working gerontology professionals the flexibility to continue working. Students applying to the program do not need to submit GRE scores, and there are no minimum GPA requirements. While online students are not able to pay in-state tuition rates, online tuition rates are significantly discounted compared to on-campus rates. Concordia University-Nebraska ranks among The 10 Best Master's in Gerontology Degree Programs! A private, Lutheran-affiliated university based in Seward, Concordia University-Nebraska offers one of the best online master's in gerontology programs in the nation. Unlike broader gerontology programs -- many of which take an interdisciplinary approach, studying aging from psychological, physical, sociological, and economical perspectives -- Concordia's program hones in on the human services aspect. The degree that students earn is a master of human services in gerontology. The program targets “servant leaders” who work in hospitals, hospices, and any setting that involves plenty of face-to-face time with older adults. The program consists of 12 courses -- or 36 total credits -- each lasting eight weeks. These courses include studies in issues in gerontology and aging, social gerontology, and mental health and aging, in addition to a capstone/practicum experience. The online program utilizes a cohort model with both synchronous and asynchronous elements, and all students pay the same per-credit tuition rate. The school does not currently offer the program in on-campus or hybrid formats, so the program has no in-person requirements. There are no minimum GPA requirements for admission, and the GRE is also not required. Concordia accepts transfer credits toward the master's program on a case-by-case basis. The school only accepts courses in which a student scored a B or higher, and students may transfer up to 25% of required credits for a program. McDaniel College ranks among The 10 Best Master's in Gerontology Degree Programs! Located about 30 miles outside of Baltimore in Westminster, McDaniel College is a primarily liberal arts-oriented institution. The school's online master of science in gerontology program stays true to those roots, taking a broad, interdisciplinary approach to the study of aging. McDaniel's online master's degree in gerontology focuses on how aging, health, and social structure relate to society. The curriculum includes sociological, psychological, and biological approaches to gerontology, and consists of 36 credits. This includes 15 credits of core courses, a three-credit independent learning project, and a six-credit thesis or capstone experience. Applicants must have an undergraduate GPA of at least 2.5. The GRE is not required for admission to McDaniel's graduate programs. In addition to offering numerous disciplines, McDaniel's gerontology program offers many options for completing the degree. Students may choose between online, face-to-face, and hybrid degree options. If students do not wish to visit campus in Westminster, they never have to do so, as the online version of the program does not include in-person requirements. As coursework is wide-ranging, graduates can find work in a wide variety of settings, including research institutes, healthcare institutions, retirement communities, government agencies, and businesses with customers who are primarily 55 and older. Most McDaniel students can complete their degree and be on their way to one of those jobs in just one year. Brenau University ranks among The 10 Best Master's in Gerontology Degree Programs! Located in Gainesville, Georgia -- a city locals refer to as the “Poultry Capital of the World” thanks to its large concentration of chicken plants -- Brenau University is a small school that has recently expanded its distance education offerings. Originally only admitting women, Brenau's Women's College is still a central part of the school; nevertheless, the university now admits men and women to both on-campus and online programs. One such program is the school's online master of science degree in applied gerontology. Eschewing a liberal arts approach, Brenau's online master's in gerontology program is pre-professional and skills-based in nature. Examples of this professional orientation are the program's fieldwork capstone project and courses such as effective communication with the elderly. Brenau's program was the first university in Georgia to earn a chapter of the National Gerontological Academic Honor and Professional Society. The program's curriculum consists of 30 credits -- 18 credits of core courses and 12 credits of electives. Full-time students in Brenau's program finish within a year. The program is accelerated, with new courses starting every two weeks. Brenau is regionally accredited by The Southern Association of Colleges and Schools Commission on Colleges. All students in Brenau's online gerontology program pay the exact same tuition. As the program is completely online, there are no in-person or on-campus requirements, as students conduct their fieldwork in their own communities. University of Louisiana at Monroe ranks among The 10 Best Master's in Gerontology Degree Programs! A key member of the state-school system, the University of Louisiana at Monroe leverages those resources to offer many distance learning programs, like the school's online master of arts degree in gerontology. This includes concentrations in long-term care administration, program administration, Small Business Management, Grief Care Management, Mental Health, and aging studies. ULM designed each concentration -- but particularly the long-term care offering -- with working adults in mind, as students enrolling in the long-term care concentration and are not employed full-time at an aging-related organization must complete additional training. Since so many students work full-time, the typical distance learner completes the 36-credit curriculum in about three years. Additionally, as many students are full-time employees, the program makes use of asynchronous learning, allowing students to complete assignments at their convenience. The program uses prompt emails and the My Homework app to help students stay motivated and keep track of assignments. To earn admission to ULM's master's in gerontology online program, students must meet one of three criteria: an undergraduate GPA of at least 2.75 (or 3.0 over the last 60 credits), a minimum total score of 800 on the GRE, or a minimum total of 1,900 when multiplying the student's GRE score by his/her undergraduate GPA. ULM is regionally accredited by The Southern Association of Colleges and Schools Commission on Colleges. National University ranks among The 10 Best Master's in Gerontology Degree Programs! A private university operating a central campus in La Jolla -- and satellite campuses throughout California and Nevada -- National University focuses primarily on adult, professional, and continuing education. Distance education is a logical extension of NU's goals, and the school is a major player in the online education space. One of the school's excellent online programs is its master of arts degree in gerontology. This master's degree in gerontology online program requires students to complete 12 courses or 54 quarter units. These units include studies in public policy and aging, psychology and aging, and counseling older adults, in addition to a nine-quarter hour integrative project that involves fieldwork and research in addressing a specific aging-related problem. Upon graduating, NU students can find work in human service organizations, healthcare institutions, government agencies, and businesses marketing to consumers over 55. As many students enrolled in NU's programs are employed adult learners, completion times vary widely. While full-time students can earn their degree in just a year, most students take longer. To earn admission to NU's gerontology program, students must have a minimum undergraduate GPA of 2.5. Students who meet that requirement do not need to submit GRE scores; however, students who do not meet the requirement must take the GRE and earn what NU characterizes as “a satisfactory score.” Tuition rates are the same at NU for all students. While the exact curriculum offered by an online gerontology master's degree program will vary from school to school, certain classes will be found in just about any such program. 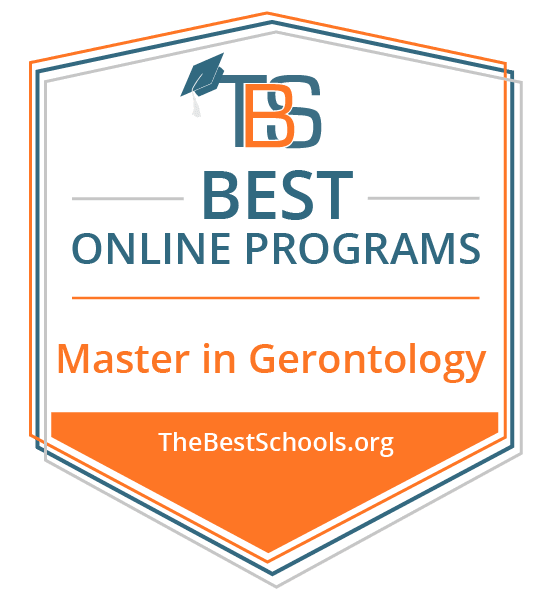 The precise titles may differ slightly, but some of the most common courses you can expect to see in the best online master's in gerontology programs are detailed below. Physiology of Aging: This course covers the physical effects of aging on the human body, including the special needs which often arise as an individual ages. This subject matter informs virtually every aspect of gerontology, so it is crucial that anyone pursuing a career related to gerontology gain a good foundation in this area. Psychology of Aging: This course explores the psychological effects aging has on an individual and their relationships with other people, including how they cope with new physical limitations, grief, and other major life changes. Anyone who plans to work in this field must understand these common concerns in order to achieve positive outcomes for the senior adults in their care. Aging Policy and Services: This course covers the types of services that are available for aging adults, as well as ethical considerations and public policy that affect this population. This is especially relevant to careers in the management of social or community programs or medical and health-related services for the elderly. Graduates of an online gerontology master's degree have a variety of career paths available to them. If you prefer to work directly with senior citizens, you might consider a career as a social worker or employee of another type of community service organization. If leadership roles appeal to you, you may prefer to seek a management position in a community service or healthcare organization which deals with elderly clients. Below are a few examples of these career opportunities. Social and Community Service Managers: These managers oversee programs or community organizations which provide various services for the elderly. These professionals are responsible for recruiting, hiring, training, and managing the employees who staff these programs and organizations. A master's degree is often preferred among candidates for these management positions, and some master's programs offer concentrations related specifically to this area. Medical and Health Services Managers: Medical and health services managers oversee healthcare facilities which serve the elderly, including clinics, hospitals, hospices, and nursing homes. These professionals may manage the entire facility, or a particular department and its staff. If you are considering pursuing this leadership position, you'll typically need several years of professional experience and a master's degree. Social Workers: Social workers help people, including the elderly and their caretakers, cope with various issues in their lives. They are often employed in government agencies, healthcare facilities, and community organizations. Clinical social workers also help treat mental and emotional issues in their clients, and must have a master's degree and state licensure.